Steve Way Builders, LCC was contracted by the homeonwers of this East Lansing, Michigan home to provide some thought for their kitchen area. 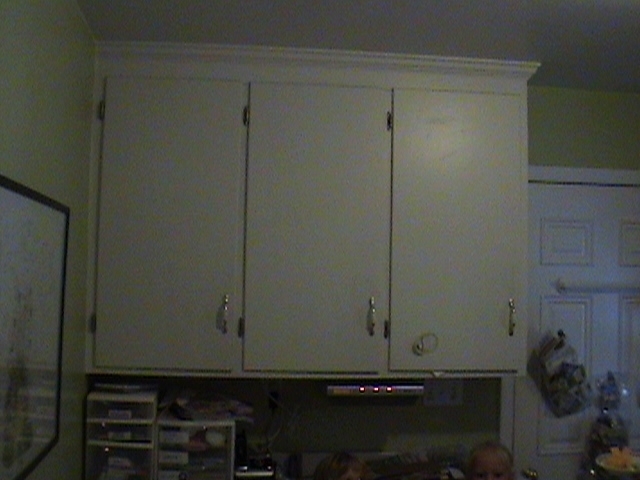 The kitchen was simply too small for their growing family. 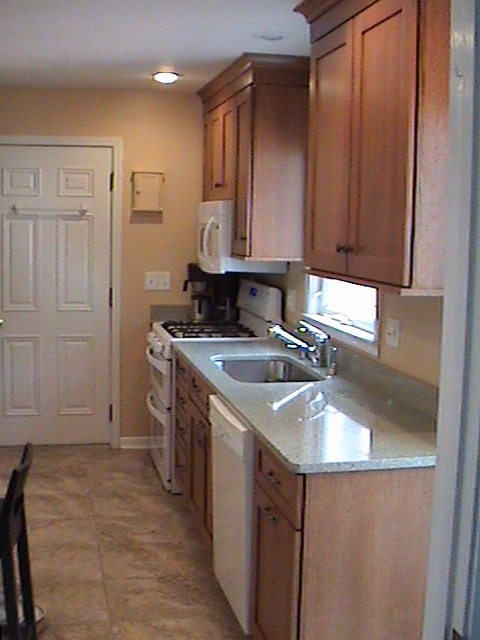 With a little design, Steve Way Builders, LLC presented a new, larger floor plan for the new kitchen space. 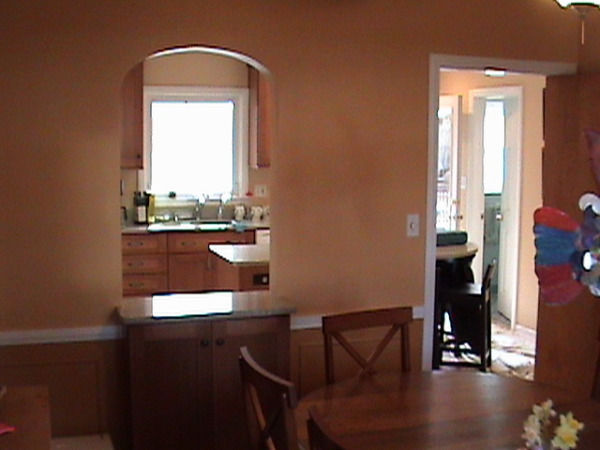 To allow for more room, the wall separating the hallway and kitchen was removed. This provided an extra 35 square feet of floor space for the new kitchen. 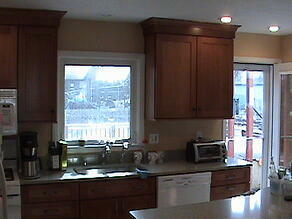 With the removal of this wall, multiple cabinets and appliances were relocated to another area in the kitchen. A second major design change included installing a cased archway into the dining room, which provided open viewing into both rooms. The new kitchen featured Decora Cabinets with a cherry finish. 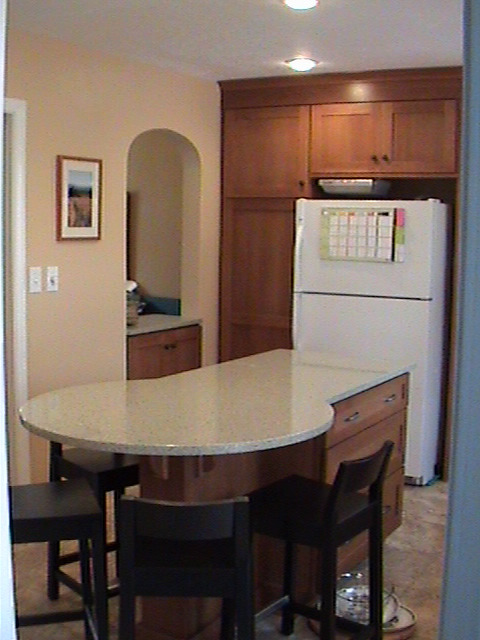 The cabinets were accented with granite counter tops. 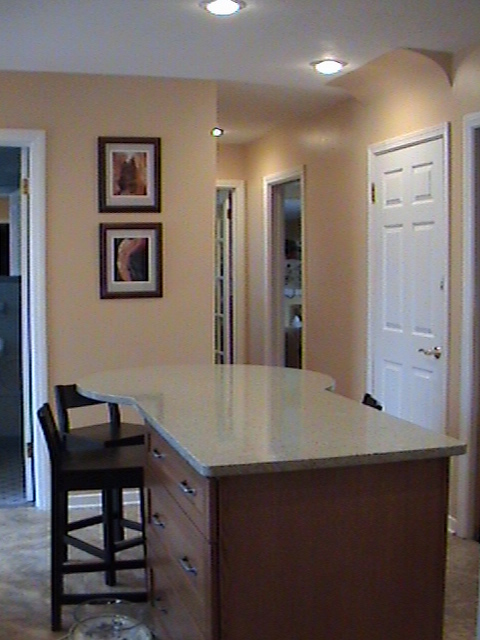 A major highlight of the kitchen was the central island which provided for bar seating and extra cabinet space that was lost with the removal of the hallway wall. Another cabinet was added under the cased archway with access from both the kitchen and dining room. 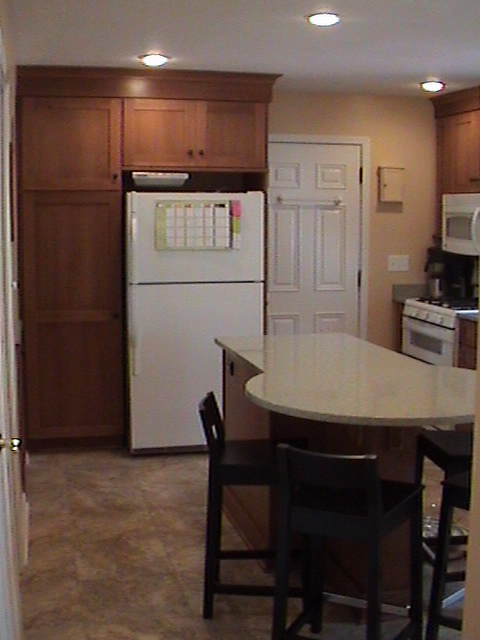 The relocated refrigerator was surrounded by a large pantry cabinet and upper wall cabinets. 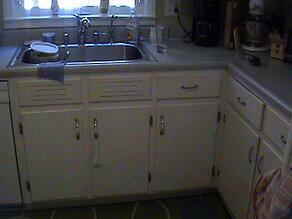 The kitchen floor consisted of 13" vinyl tiles. 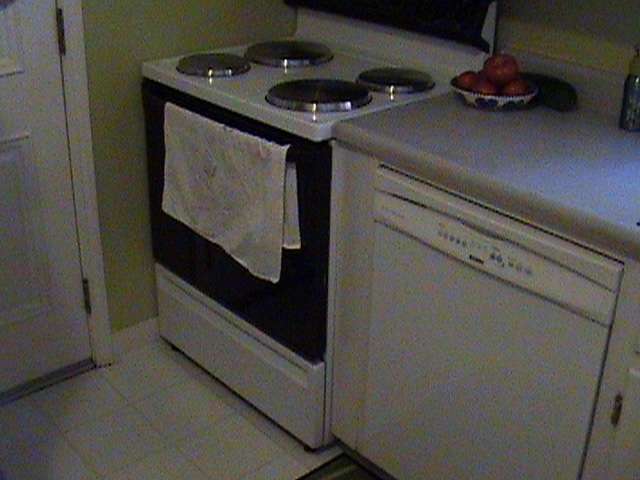 The new appliances included a dishwasher, range, and microwave. With the removal of the hallway wall, the kitchen now provided direct access onto the backyard deck and patio. To finish this area, a full one light steel door was installed, as well as a matching storm door. 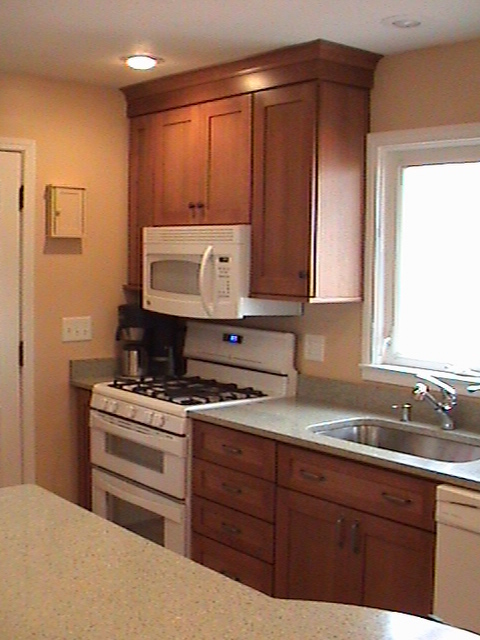 To help save costs for the remodeled kitchen, trim was removed and re-used. 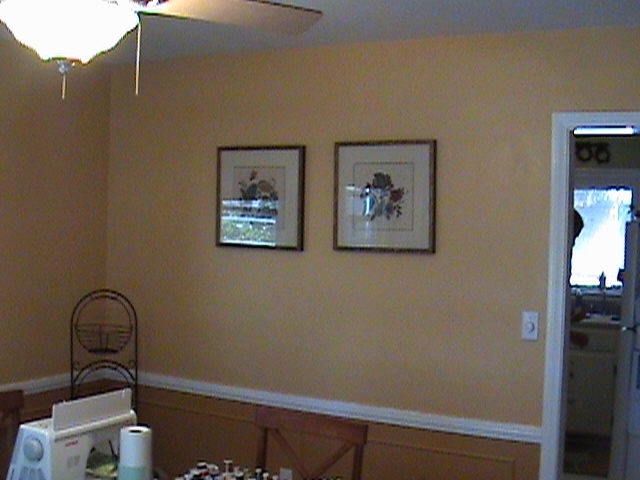 Painting was also completed by the homeowners for cost savings. 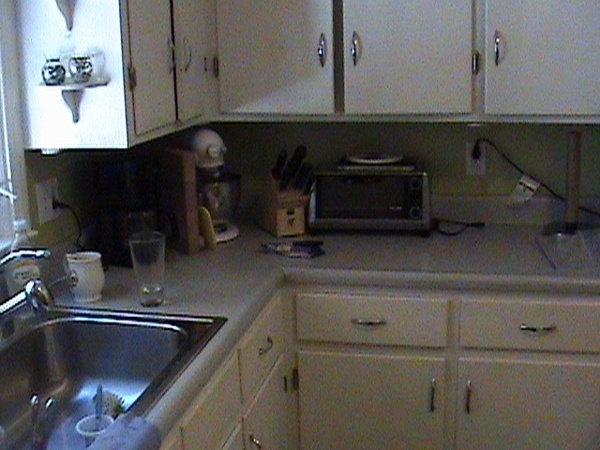 More before and after photos for remodeled kitchen. 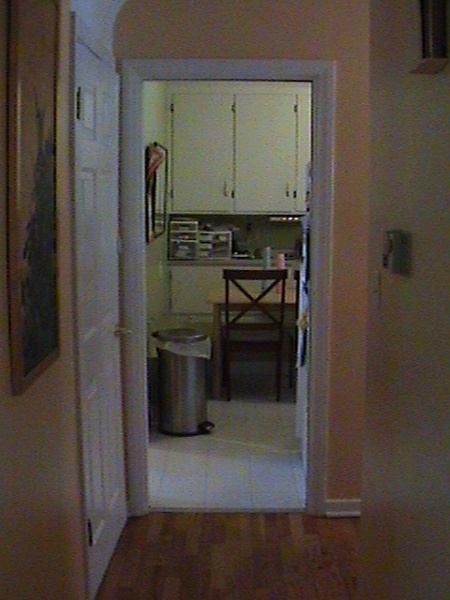 Entryway into kitchen before hallway wall was removed. Wall cabinets where fridge was to be relocated. Cabinetry on the wall that was removed. Space opened into hallway. Newly located fridge and kitchen island. Looking into the hallway from kitchen where old wall once was.